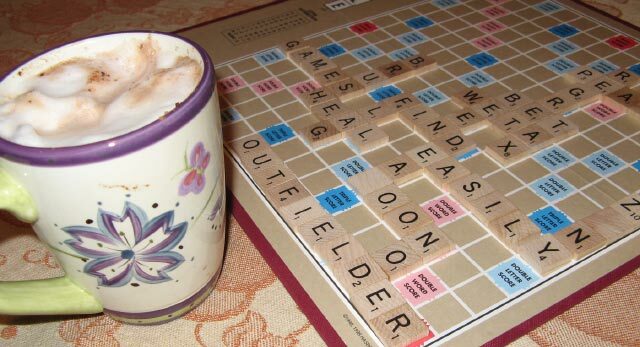 As a treat to accompany the Saturday night Scrabble game I made some special cocoa. I used one of my favorite little kitchen toys, the aerolatte frother. This handy little gadget froths milk without the use of steam, so it is perfect for cappuccino lovers. But it is also great to add a special touch to lots of other drinks. In the summer you can whip up chocolaty drinks all frothy cold and refreshing. When it's hot drink season it's great for making homemade cocoa. Tonight I made cocoa based on the cocoa recipe off the Hershey's box and a recipe idea from the aerolatte site. It's like cappuccino only with cocoa on the bottom instead of coffee. I made a large batch which provided seven generous mugs full. Heat 3 cups of whole milk together with 1/4 cup sugar and a teaspoon of vanilla in a small saucepan. This will be the hot milk that you froth. While that is heating, prepare cocoa in a separate large pan. Mix a scant half cup cocoa and 3/4 cups sugar in the pan. Whisk in 2/3 cup hot water. Bring to a boil; stir continuously and boil for two minutes. Add six cups whole milk and heat thoroughly. Stir in two teaspoons of vanilla. To serve, divide the hot milk into your mugs. Each mug should only be about a quarter to a third full. Froth each portion of milk until thick and foamy. By the time you are finished frothing the last cup, the milk should have set a bit and thickened further. Then pour the cocoa through the froth into each cup, filling until the froth has risen up over the top of the mug. Sprinkle with a bit of cocoa for garnish. Serve at once. Very rich and delicious all natural treat. You don't even need any marshmallows, though it might be hard to convince the children. They may still want to playfully toss them at each other eat some on the side. By the way, outfielder was worth 42 points but zany topped it with 45.